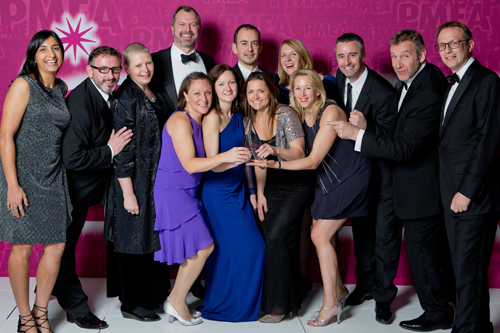 AbbVie picked up the top award at last night's PMEA Awards for the second year in a row, this time seeing off strong competition from fellow finalists Astellas Pharma EMEA, Genzyme and Allergan. The firm won the Open Health Award for PMEA Company of the Year at the ceremony in the Lancaster London Hotel, thanks to its patient-focus. Commenting on the company's win, the PMEA judges said “AbbVie won because they truly put patients at the centre of everything they do”. This year entries were assessed by an experienced panel of experienced, independent industry judges from the likes of EY, Quintiles, Engage, PA Consulting, Cello Health Consultancy and PWC, as well as patient charity Whizz-Kidz. Also scoring well in the Open Health Award for PMEA Company of the Year was Astellas Pharma EMEA, which took home a high commendation at the London awards ceremony. The company earned particular praise from the PMEA judges for an “impressive growth rate in 2014”, which the judges said “created a tremendous working environment and delivered some compelling solutions”. The PMEA programme, run by PMLiVE publisher the PMGroup, is specifically designed to recognise and commend excellence, best practice and innovation in local, European and international markets. Its categories reflect current business practice of striving for customer and patient-centric education and support programmes; brand lifecycle excellence; and outstanding work.